Thank you Richard. I hope you have beautiful soft snow falling and all of the cozy goodness that comes with a cold Christmas. I especially like the version from Eden’s Bridge. 🙂 🙂 🙂 🙂 ❤ To you too sweetie. I love this song, Staci. So serene. Merry Christmas to you and your family, my friend. And a Merry Christmas to you and your family as well Rob. Merry Christmas Staci! Safe travels, and I hope you and your family enjoy the season. Ohhhh, and you too Wendy. A very Merry Christmas to you and your family. Lorrie, you are the queen of encouragement. Seriously. You always have the nicest comments, and I appreciate you. Thank you so much. I am so glad this touched you. May you and your family have a very Merry Christmas and a happy new year too, my friend. Thank you so much Lorrie. And a very Merry (belated) Christmas and Happy New Year to you too, my friend. Beautiful thoughts, my friend! What a special season this is and really every day is special when we know the Breath of Heaven. I love the artwork and it’s message! Awwwwwm, what a lovely comment. Thank you so much Sibella. You’re the wonderful soul. Merry Christmas to you and your family too. I hope it’s filled with warmth, love, peace and joy. Beautiful, Staci! Thank you and may God keep you all in His care today and throughout your travels. Love your art and thoughts. Merry Christmas to all your family. Awww, thanks so much Rob. Merry Christmas to you and all of your family too. Such a heart warming post….Merry Christmas to you and the near ones. Thank you so much. I’m so glad you enjoyed it. A very Merry Christmas to you and your loved ones as well. Thank you so much Heather. Merry Christmas to you and your family as well. Hi Tosha. Thank you so much. I’ve been so busy that I haven’t been able to read many blogs. I hope to read some tomorrow (including yours 🙂 ). Thanks. Much love and light!! Hi Carisa. Thank you so much. I’m so glad you enjoyed it. I’ve been away, and super busy. Haven’t been able blog much. I hope to get by your little corner of the blogosphere tomorrow, my friend. Awwwww, as are you to me Carisa. I hope you had an amazing Christmas and that your New Year’s celebration is tons of fun. Awwww, thank you so much. I’m so glad you enjoyed the post and song. A very Merry Christmas to you and you loved ones as well. Thank you so much Geralyn. A very Very Christmas to you and all of your loved ones too. I’ve been away and super busy, so I haven’t been on WP much. I hope to catch up a bit tomorrow before my hubby gets back. Hi Wendy, lovely Christmas card, and you Christmas girl in the previous post is lovely. I see you are having lots of fun down there in the summer. Merry Christmas and Happy New Year to you and your family. Hi Elizabeth. Thank you so much. I’m so glad you enjoyed them. I don’t know if ‘fun’ is the right word. Lol. I’m hoping to have more fun after New Years when we get to go to the beach for a few days. Yeah! Merry Christmas to you and your loved ones too Elizabeth. Dear Staci, so sorry for the name :(. A wonderful Christmas for you and yours, and for sure, beach is always more fun. Hahaha. No problem at all. I’ve done it before too. Hope you had a nice Christmas Elizabeth and that your New Year’s celebration is fun. Beautiful, isn’t it. I love it when God stills and quiets me with his love. Nothing like it. May your Christmas be filled with much love, joy, peace and loved ones Natalie. 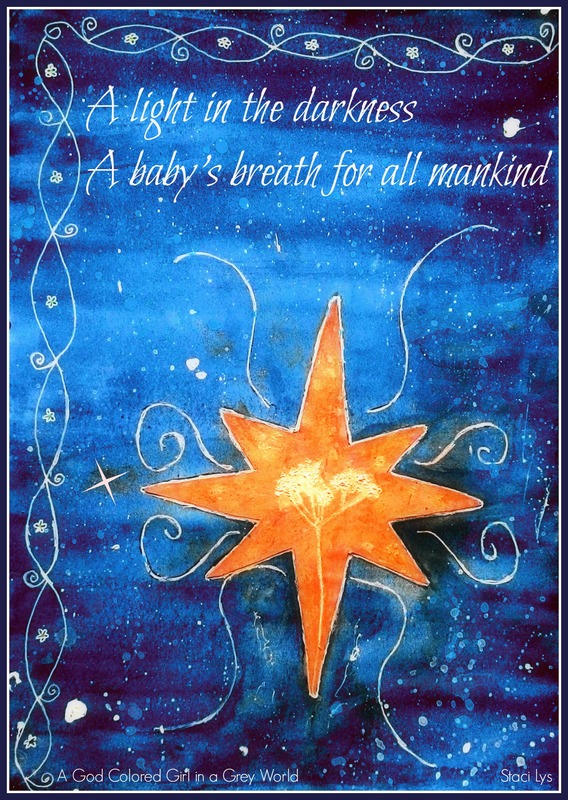 I simply adore this card…’ A light in the darkness, A baby’s breath for all mankind’..perfect! Ohhhhhh, thank you so much Saaransh. I’m so glad you like this. And I’m glad you enjoyed the song too. Isn’t it great. The original is from Amy Grant, but I much prefer this version. Many blessing to you now and throughout all of 2016. Mary was very brave; a reminder for me in times of uncertainty. Merry Christmas & Happy New Year Staci! Can you imagine being in her shoes? Merry Christmas and happy new year to you too Timi. Sorry for the late reply. My daughter was sick on Christmas day, then I was sick yesterday, and we’re both not 100% yet. Aw. I’m sorry to hear this. Get well soon ! And a very Merry Christmas to you too Leyla. Thank you Leyla. And to you too. Thank you Nihar. I hope you had a lovely time. My daughter and I have been sick, but we had a nice dinner with two other families on Christmas eve. Happy New year to you, dear friend. Merry Christmas, Staci! I appreciate your thoughts on this beautiful song. I understand with the change of climate, we are prone to sickness, you too take care, hope your daughter is fine and prepare well for the New Year. Hi Staci, Have a safe Journey. I will miss having you around but I know you will be spending quality time with your family, so happy for you. I left you a small Christmas note in the E-mail, I hope you will get it. Thank you so much Zee. I’m off to check my email right now. Thank you so much. I will visit. Kisses and hugs from Ha. Awwww, thank you so much Ha. I hope you had an amazing Christmas with your family. Love and peace to you too. Thank you dear! Yes I did have a happy and wonderful 2015 with my beloved ones! I wish you a 2016 full of love and peace! It’s wonderful how you interpreted Breath of Heaven. I have listened to this song from time to time and never thought about it in the way you interpreted it. When I think deeply about the words in this song and what they mean, the song becomes more powerful and significant. Love your artwork as always and l look forward to reading more of your posts. Also I hope you’re enjoying your time with your family! Hi Crystal. So sorry for the late reply. I was traveling and didn’t have much internet access. I’ve just returned and am up and running again. Thank you so much. The song really is so powerful, isn’t it. HOw was your Christmas and New Year’s? How are things on the job front? Did you get your book put on Kindle? Heyyyyy Crystal. I can’t believe I didn’t receive this comment in my notifications. Good thing I stopped by this post. Thanks for letting me know. That’s great news. I’ll have to get it now. Yeah!!! So glad you had a nice Christmas and New Year’s as well Crystal. We’re still a bit in holiday mode here, being that it’s summer. School starts up on February 1st. Can’t wait to get back into a regular schedule. I have a lot on my plate this year. Heyyyyyy Benjamin. So sorry for the late reply. I was traveling and didn’t have much access to the internet. I guess you can say I was on a mini hiatus. I’m back now though. Happy New Year to you too. How was your Christmas and holiday season? No worries. It was a pretty good holiday season, so thank you. I was sick for awhile but starting to feel better almost. I hope everything is great on your end and this year is fantastic for you. Hope you had a wonderful Christmas Staci, and despite the absence of snow and all that is associated to your memories in Canada, I hope and pray it was very special and wonderful. This is a beautiful post. I marvel at the simple faith and trust of Mary, despite her fears and vulnerability. Hi Carl. I had a lovely Christmas Eve. My hubby got back from the Middle East on Christmas Eve and we had two other families join us for dinner. It was simple, non-stressful, and relaxed. Then my daughter was sick all day on the 25th, and I was on the 26th. How was your Christmas and New Year’s? Thank you so much. I’m so glad you enjoyed this post. We had a very relaxing Christmas and New Year. I do a Christmas Eve service at church, and Christmas, just had our immediate family. Sometimes we have others join us, who don’t have anywhere to go for Christmas, but couldn’t find anyone this year. It would have been tough for you and your daughter to be sick over the Christmas holidays! My daughter is only five and this is the second Christmas that she was sick. The first time she was sick on Christmas day was a cold with a fever. Heyyyyyy Neha, so great to hear from you. Happy New Year. I just got back from my travels. I’ve missed my WP friends and am looking forward to get back to blogging. Welcome back my friend! Hope you had a great time ! I had a good holiday not too long so couldn’t visit home this time…stay blessed! And thank you too for visiting me. It’s one of my favourite Christmas toons. Yes, ‘hold me together’. I’ve need that help often. Hahaha. Happy New Year to you too, and a great Sunday.